Tomorrow is the big election, and I’m finishing this profile series with the ultimate underdog: Meagen LaFave, Wildrose candidate for Edmonton-Strathcona. She’s running for a party that’s climbed to the top of the provincial polls, but in a district that’s still very tough. Seeing what makes a libertarian like LaFave want to run in a safe NDP riding was probably the most interesting experience I had working on this series. I talked to her about how her experience in health services affects her views on health care reform, what a libertarian thinks about recognizing rights for transgender Albertans, and why she chose Strathcona over any other part of the city. Don’t forget to vote Monday, even if you’re not registered. If you’re in your home riding, all you need to do is bring government-issued ID to your polling station. The Council of Alberta University Students can tell you about the absurdities of forcing post-secondary students to vote from their permanent address. Meagen LaFave says she even writes "Sorry I missed you" post-its while she's watching TV these days. 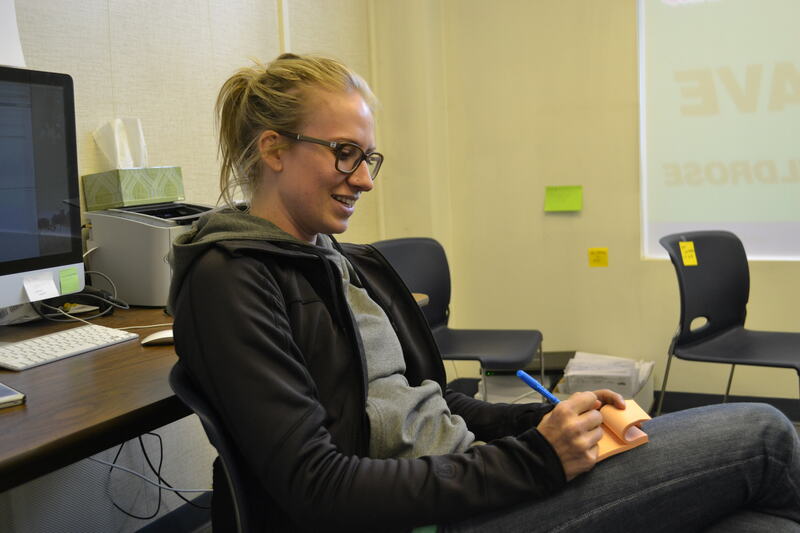 As Meagen LaFave’s team watches a wind storm die down from her campaign office window, she coughs and finishes writing a stack of “Sorry I missed you” post-its. At 23, she’s the youngest Wildrose candidate in the province, and she’s still getting over a cold from pulling out all the stops campaigning. The NDP’s Rachel Notley is the current MLA for this riding, and their party has held it for most of the last 26 years. Notley’s predecessor Raj Pannu was popular enough to earn the nickname “Raj Against the Machine”. It doesn’t get much safer for the NDP in Alberta, but LaFave says Strathcona’s the part of the city that fits her best. “I’ve lived in this riding, I love this riding,” she says. This is where she long-boards, shops, and watches theatre. It’s also where she works for a research group and bio-specimen business within the U of A. There are a lot of conservatives in this area looking for an alternative, she says, and she thinks it helps that she’s a libertarian but not a hard-line social conservative. LaFave says she couldn’t disagree more with Allan “lake of fire” Hunsperger about condemning gay relationships, for example. She believes it’s his right to say what he thinks, though. What made LaFave want to run, knowing the odds? “I’m a pretty type-A person,” she says. “I went from being a bookkeeper to the business manager of my company.” So looking at the challenges, she figured if you’re going to get your hands dirty, you might as well get them really dirty. “The libertarian values, frankly,” were what LaFave says attracted her to Wildrose. She had watched their development for years while studying political science and history at the U of A, and finally joined the party in 2011. Like many Wildrose members, she used to be a PC supporter. Eventually stories of doctor intimidation, seemingly ever-increasing hospital wait times and accountability issues convinced her the party was broken. She didn’t expect Wildrose to take off so much, though. Born and raised in Edmonton, LaFave says she has “quite a bit of blue collar” in her. She credits her entrepreneurial father and accountant mother with teaching her to be fiscally responsible. The day she turned 14, she started her first job. The Wildrose Party has been criticized for fielding so many candidates like LaFave without experience holding public office. There are parallels to the flood of MPs elected in Quebec from the NDP just last year, many of whom were mocked at first but have proven to be capable politicians. LaFave admits she doesn’t follow federal politics much, but thinks she has weight from her work experience, and is privileged to see dysfunction in our health care system through her work with Alberta Health Services and the U of A. 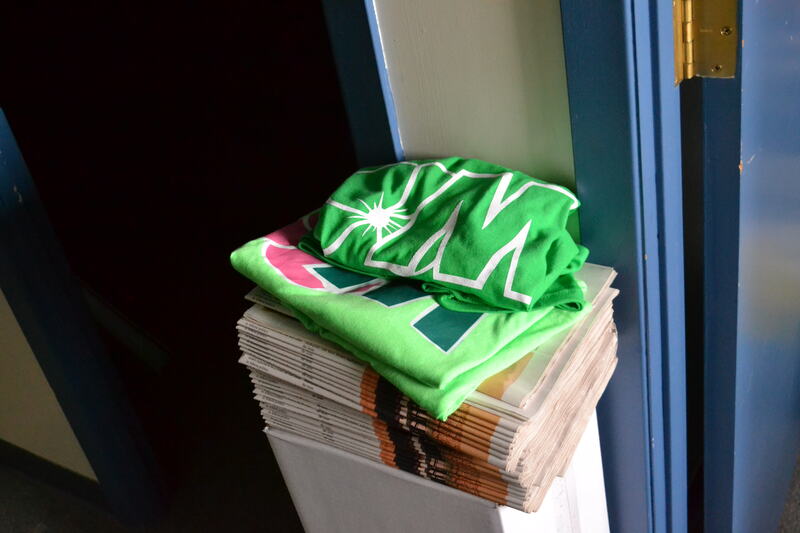 Beneath the Wildrose T-shirts, LaFave's office keeps a stack of the Edmonton Senior papers where they bought an ad. Health care questions are definitely LaFave’s favourite to answer at the door. One woman she meets is encouraged by Wildrose’s promise to increase funding for home care, but wary of a two-tier system emerging. LaFave emphasises that they’re only proposing publicly funding more private delivery if a wait-time guarantee isn’t met. “But what happens when that door opens?” the woman asks. It’s a question LaFave doesn’t mind answering. Her experiences working with Alberta Health Services have made her adamant that big changes need to be made to the province’s health care system. There’s a huge amount of waste in the bureaucracy, she says. Because her company is a not a for-profit entity connected to AHS and the University, it has to pay a large chunk of any funding it gets directly to their joint research centre NACTRC. LaFave says over the years NACTRC has stopped providing even basic clinic space in exchange for that money, and concludes the money is now just boosting bureaucrats’ salaries. I ask LaFave why not spend her energy reforming the bureaucracy within the public system if she has these insights. There’s a lot of evidence that private delivery of health care is more expensive than public delivery. For example, Canadian Doctors for Medicare has published a report showing the “pac man” analogy of health care continually eating up more of provincial budgets is mostly due to shrinking revenues and rising costs of private services like drug and dental insurance. LaFave also works directly with billing, so I point out that a lot of research shows the exorbitant costs of the US system are partly pushed up by the amount of private health care providers they have trying to untangle a web of who pays for which patients to use what services (This American Life has a great special called More is Less that explains this in more detail). LaFave is firm that she sees so many superfluous people working in health care billing in Alberta that cutting their jobs would balance that out. And the wait-time guarantee would just be a relief valve, she says, until more front-line doctors and nurses are hired. What seems fuzzy is how a Wildrose government would gauge when they cross that finish line. But she tells me that questions about homophobia, racism and other bigotry among Wildrose candidates have outgrown most of the policy questions people pose. So I ask her what the libertarian response would be if a gay constituent said a marriage commissioner had denied their right to that public service, by declaring it violated their conscience rights. She pauses. It’s an obvious tension in her desire to champion individual rights, and she doesn’t have an answer yet on how to negotiate them when they compete. She’d probably want to help both sides resolve the issue through the courts, she says. Finally, I ask Lafave about the Wildrose pledge not to legislate on contentious moral issues. This has mostly been framed as a way to reassure voters they won’t try to do something like de-list abortion. The flip side is it implies they won’t work on expanding legal protections for groups like trans people. A transgender rights bill is working its way through the House of Commons yet again. This attempt to explicitly protect people from being denied things like housing, employment, and health care because of differences in gender identity and expression has been killed so many times that its old sponsor has actually retired from Parliament. With Albertans like teacher Jan Buterman lack legal protection when they’re fired for how they express their gender, it’s a serious issue that could be addressed provincially. LaFave admits Wildrose’s pledge means they wouldn’t bring any such legislation forward. That doesn’t mean she wouldn’t raise the issue with her caucus if constituents told her it mattered. Insightful article and a good interview, thanks!